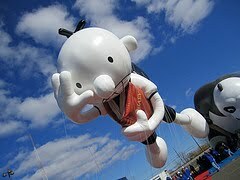 A fun look at Diary of a Wimpy Kid at Macy's Balloonfest 2010. What treat to see these! At my school, there is a gentleman who has been to the Macy's Parade every year since the early 80's, and has been a balloon handler the last few years. This year, he's signed on to "handle" the Wimpy Kid! (He promises pictures and stories!) Oh, and he also "handles" fourth graders-- he's a great teacher! Jenni, What a GREAT story he will have to share. Lucky kids!